Do you understand things like indirect land use when it comes to regulations via departments like the EPA due to the RFS? Me either. And I’ve sat in on conferences and discussions and interviews on the subject for a while now. That’s because an issue like indirect land use involves predicting the future based on certain assumptions that may or may not be valid, especially if they’re based on out of date data and information. So that’s part of what the NCGA is dealing with at their Land Use and Carbon Impacts of Corn-Based Ethanol Conference which has many different presenters talking about their models and research. A large crowd is gathered to ask them questions. 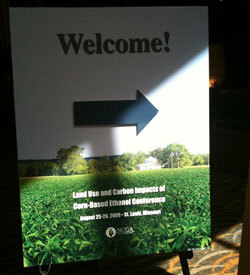 The Conference Chairman is Jamey Cline, NCGA Director Biofuels and Business Development. I caught up to him on a break to learn why NCGA was conducting this event and what they hope to achieve as a result. Jamey says that regulations from the California Air Resources Board (CARB) and from EPA on the Renewable Fuel Standards (RFS) have brought up a number of questions and this conference was put together to ask them and receive answers in a public forum with various stakeholders. A lot of these current or proposed regulations are based on assumptions and economic theory and so questions need to be asked to make sure the latest data is being used and reasonable predictions are made for the future. He says that these issues are extremely important to agribusiness and corn growers in particular because if the CARB regs hold up, by 2012 they will effectively shut off that market to ethanol. Additionally, one presenter said that due to the proposed climate change bill and RFS, approximately 27.1 million acres would be taken out of production across the Unites States. That would have a huge impact on our economy, especially in rural areas.